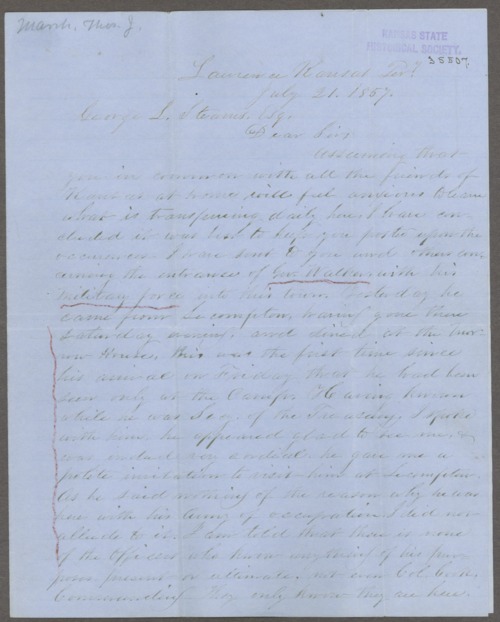 Thomas Marsh in Lawrence, Kansas, writes to George L. Stearns regarding Governor Robert Walker and his forces entering Lawrence. Marsh spoke with Walker and found him cordial, however, no person in Lawrence knows what his purposes are; Marsh seems suspicious. Marsh wrote to Stearns on multiple occasions in July to detail the events that took place in Lawrence as they unfolded. A searchable, full-text version of this letter is available by clicking "Text Version" below.